But we’re still somehow reading the tag twice for the diet and carbon apps – and, come to think of it, the shopkeeper probably had to do that in the first place too – for their own systems. And how would we ‘prove’ that we’d disposed of the bottle correctly? Also there’s still a need for an ‘external’ calculation; and why would the Tax Office trust the calculation? All in all, it’s not really as ‘joined-up’ as the IoT ideal should be. Maybe that’s where the clue lies? Let’s jump a few steps (years) ahead and think how we might ideally like this to work. How about this? OK, so how would we do that? (1.) is where we’re heading at present. But for how much longer? The number of apps isn’t viable if we’re going to get them all talking to each other. If there are a apps, all needing to talk to each other, then there are a(a-1)/2 potential inter-app data interactions. Although there might not have to be every one of these, in principle, each time a new app is added, it has to be written to talk to each of the a others, each of which need to be modified to talk to it. There will be huge levels of data/process duplication and the potential for loss of synchronisation would be enormous. And we still haven’t addressed the question of why the Tax Office would want to trust any of this. An alternative would be to produce some sort of controlling ‘SuperApp’, which acted as intermediary among all the others. With a modular design, it could be written specifically with the required flexibility to welcome new domains/apps into the system. Each and every individual app, on the other hand would only need to be written to communicate with the SuperApp, and would be otherwise impervious to later additions. Moreover, the SuperApp could be an approved/certified/required government-issue to address the question of trust and reliability. 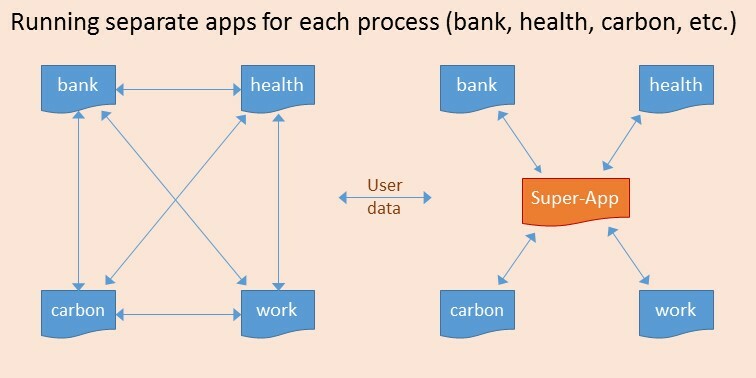 Data would only be stored once for all apps and the SuperApp would manage domain access to it – including changes. But, hang on a minute; if the SuperApp is going to control everything, what’s the point of the other apps at all? If all the apps are running together and sharing resources (hardware, and data), and the SuperApp is running an approved algorithm and verifying everything it’s getting from each of the others, across all devices, then why bother with so many individual apps in the first place? 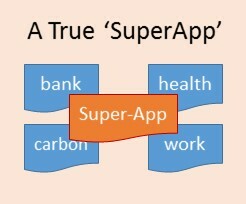 Why not just let the SuperApp collect and process all relevant data and process it internally as needed by each domain. We’ve arrived at (2.). Would we really sign up to a system like this? And the global identity would have arrived. And will it really happen? Well, the answer may be out of our control – and may be driven more by commerce than ethics. It’s not quite inevitable but, like many other future threats, it’s unfair to blame the technology. The technology’s coming, whether we like it or not. How it’s going to be used isn’t a technological question: it’s a political and economic one. To stop it, there will have to be much more fundamental changes to bigger underlying systems. That may be the unlikely bit. Ultimately, when we talk about privacy in future, it’s not going to have much to do with what we choose to share on social media, etc. And it may not be something we have much control over anyway. We need to break out of this notion that citizens/consumers have individual autonomy – we never have had and we (possibly) never will. Choosing to give away our data isn’t a personal decision – it’s a political one – so we can only fight it together, not individually. But, if we’re really happy to wave good-bye to every last shred of our privacy anyway – and we appear to be, … why not!? This entry was posted on Wednesday, February 1st, 2017 at 12:09 pm	and tagged with Big Connectivity, Big Data, Integration, Internet of Everything, Internet of Things, Personal data, Privacy, Real Internet of Things and posted in Hardware, Philosophy, Politics, Software. You can follow any responses to this entry through the RSS 2.0 feed.